On Valentine’s Day, Anna Therese Day’s luck ran out. It had held for five years and 20 days as a freelance American journalist documenting the frustrated aspirations of the Arab Spring and the rise of ISIS. But in Bahrain earlier this month, while covering the fifth anniversary of the Persian Gulf kingdom’s violently quashed 2011 uprising, the 27-year-old reporter and her film crew were arrested. Having dared to document young Bahrainis clashing with police, Day and her crew were charged with posing as tourists and taking part in illegal demonstrations. Even though her captors knew they were reporters, they were “accused of participating in ‘unlawful protests,’ as agitators,” Day told me when we met in New York on February 21, three days after she returned to the states. Officers bound Day’s hands and ankles, moving her four times from one jail to another throughout the night. They Googled her and pulled up a story she had written for The Huffington Post. “You’re a journalist, you hate our government, you’re working with terrorists!” her interrogators shouted. Deprived of water, food, medicine, and sleep, each of the four Americans was separately questioned about their sources and one another. Their captors wouldn’t permit them to call the U.S. embassy, their lawyers, or their families. After 24 hours, all four were brought before a court to be charged for participating in illegal demonstrations. “I am not going to be sentenced for two years!” Anna shouted. Her guard tried to calm her down by bringing her a chicken dish. But there was a much greater worry on her mind: confiscation of the film they had shot for an in-progress documentary. “Where’s the film?” her crew asked, when they were briefly reunited. As unlikely as it may seem, the story of Anna Day, an intrepid and slight blonde twentysomething from Idaho with a name like a Beatles song, is entangled with the saga of how peaceful political change sought by young Arab activists collapsed against the genocidal appeal of the ISIS narrative. Waking up in Cairo on the first day of protests, Day couldn’t contact her friends. The government had shut down opposition web sites. She started walking toward Tahrir Square, but the police had blocked every entrance. “I was able to take pictures on my phone, playing the clueless tourist role,” she told me. She heard a great rumble from a nearby street. Police rushed in frantic mobs toward the noise. When throngs of protesters broke through the police lines, Anna Day was right there to capture photos and video of Muslims and Christians, women and men, and to bear witness to the momentous victory. She tweeted, “The revolution has begun. Call me!” and put her phone number up. In no time, she was contacted by The Nation, CNN, and The Huffington Post. That’s how, at 22, Anna Day went from being a student to a war reporter. Anti-government protestors defy the curfew in Tahrir Square on February 1, 2011 in Cairo, Egypt. Photo via Getty. She used social media to set up meetings with rebels in other repressed countries, and made the rounds of revolutions from Bahrain to Libya. Back in Egypt, she noticed young men from Syria showing up. Why? They wanted to learn how to make a revolution. They told her about horrors back home: President Bashar al-Assad was brutalizing peaceful protesters and ordering children tortured for drawing graffiti of him. They begged her and other journalists to come and report on it. In 2012, she first crossed the Turkish border into a heavily mined no-man’s land and interviewed “Syrian kids with guns” who guarded a homemade flag of the Free Syrian Army. She saw these as promising, if feeble, signs of another Arab Spring revolution. In Aleppo, Syria’s largest city and industrial center, she was interviewing doctors in a hospital when one of President al-Assad’s barrel bombs—a whirling mix of high explosives and shrapnel—shattered a residential area of the city. Screaming ambulances kept bringing in horribly mangled residents. Day froze. What to do, just keep shooting pictures? Then government helicopters began shelling the hospital. That summer was the beginning of the government’s aerial bombing of schools, markets, and hospitals in rebel-held territory. By fall, one of the first American freelance journalists, James Foley, was kidnapped. Day was on the front lines in Syria when the tide of war reversed in 2013. She was only 24 and could talk to the free Syrian rebels as peers. They trusted her. And like them, she was raised in the age of social media. These attributes gave her an insider’s perspective on how this war went so wrong for the West and so right for ISIS. She kept writing and producing packages for CBS, The Daily Beast, and Vice. She felt upbeat, despite dodging shells wherever she was reporting. But by the summer of 2013, she saw the first signs of a menacing transformation. It was in a cheap, smelly hotel on the Turkish border with Syria that Anna Day noticed the first of the foreign fighters. Hotel Jihadi, she called it. Every room was jammed either with freelance Western journalists, Syrian families fleeing bombs and torture by Assad’s war, or strangers—bearded young men who looked neither Western nor Syrian. “Let me see your passport,” she asked him one night. It wasn’t until a Syrian man kept hitting on her one night that Mohammed began to open up to Day. After chasing the suitor off and yelling at him in Arabic, Mohammed told Day that he was from Saudi Arabia, and that he was shy around unveiled women. Day made friends with him by sharing her chocolate chip cookies. He was in Turkey acting as a middleman, he told her, to arrange fake passports for men coming in from all over the Middle East to fight. “To fight with whom?” she probed. “As martyrs for the global jihad.” He announced proudly that he had been selected to recruit men as suicide bombers for al-Nusra Front, the official al-Qaeda affiliate in Syria. Day had begun to see mass defections by moderate rebels going over to al-Nusra. The Free Syrian Army rebels had never received the weapons and ammunition they expected the U.S. to provide. (It wasn’t until May 2015 that the Pentagon announced a controversial program to train a few hundred moderate Syrian rebels to use small arms and battlefield tactics. The program was suspended in October.) The pitch from al-Nusra was simple: You will get food and a gun with bullets in it. “It seemed logical that angry young men whose schools and homes were being bombed would defect to more radical groups,” Day told me. Al-Nusra and the al-Qaeda affiliate in Iraq that became ISIS were friendly rivals in Syria, at first. But by 2013, the Sunni rage spilled over from Iraq. ISIS in Syria began making all too real the fantasy it had openly proclaimed for a decade: “Our Caliphate.” Their fighters were erasing the border between Syria and Iraq while the West continued to treat the two as sovereign countries. Whether by design or denial, America policymakers and newsmakers were a year behind the eruption of ISIS. It wouldn’t be long before Mohammed, like many of the foreign fighters who came to Syria, was attracted to the fierce black riders of ISIS. Toward the end of the summer of 2013, during Ramadan, Anna Day saw Mohammed again at Hotel Jihadi. He had grown a long beard. “You look like Osama!” she teased. He smiled. She proposed a secret interview with him and several of his ISIS recruits. Yes, she was a freelance journalist, she told him, but the BBC, CBS, CNN, and The Daily Beast-Newsweek had been taking her work for a year. Mohammed was impressed. They agreed to terms: Anonymity guaranteed. She removed the SIM card from her cell phone, because Mohammed didn’t want to be tracked and targeted with a drone. They met at an illegal border crossing. She paid a smuggler $100 and climbed into a floating garbage can to cross the Orontes River. She had told only two Syrians of her mission, fixers who would be helpful if she were abducted. She told none of the journalists in her world other than her emergency contact, a retired reporter. Settling into a rattletrap sedan driven by Mohammed, Day was hot underneath her full Muslim garb of black dress and the black hijab that hid her light hair. But she found the rolling hills and forests of Idlib province idyllic. Mohammed stopped to pick up two Saudis and a Pakistani, his recruits. Their dinner would take place in an abandoned villa that ISIS had been using as a safe house to welcome foreign fighters. The young men were breaking ISIS rules to talk to a reporter—even worse, a woman. But by then, Anna Day had become friends with Mohammed. She let him know she didn’t want him to blow himself up. “You sound like my sister,” he told her. He admitted that his whole family was against his new avocation, but it was his older sister who gave him nonstop grief. ISIS preparing to execute 25 soldiers in Syria. Image via screengrab. But no argument could break through the young men’s fantasies about the future that awaited them as ISIS fighters. All four of her dinner companions had left their respective countries to join the “Syrian jihad against the Shia donkeys,” as one put it. They were promised to be married off to Syrian or Lebanese women, prized by Middle Eastern men as the most beautiful. Of course, a darker destiny awaited most of these post-adolescent recruits. Yet Day found more in common with men like her dining companions than with the Syrian rebels, who spoke no English and were more provincial. Like her, these early ISIS recruits were graduates of Western colleges, spoke fluent English, and were under 30. Mohammed knew of the Smurfs. The young Pakistani, 22-year-old Ayman, showed her a photo on his iPhone of himself in Times Square, looking like any teenager attempting a patchy excuse for a beard. “I first started learning English from American cartoons, but when I got older, I really liked Boy Meets World, do you know it?” he asked her. “Inside ISIS” was the headline Anna Day put on her story for The Daily Beast. The Western world knew very little about ISIS at that time. The news site’s staff, although well aware of the Islamic State in Iraq, thought it was too deep in the weeds for a headline. Day pushed back: Even though Americans knew next to nothing about ISIS, it was their fighters who had the momentum in Syria. They had been disowned by al-Qaeda Central for being too savage. Erasing the border between Syria and Iraq, they were a transnational threat. That summer, in a sudden about-face, the local populace in the Northwest invited ISIS across the countryside. The anti-Assad rebels were widely believed to be profiteering off the war. People hoped the pious jihadists in black would restore order in the chaos left by the West’s hands-off policy. In Syria, ISIS finally took an air base held by the Syrian government. In the same two-week period, ISIS troops in Iraq blew up the horrific Abu Ghraib prison and freed 500 hardened prisoners. Along with Saddam’s former Baathists, these embittered zealots were prepared to lead the most barbaric of religious wars. They used sadistic videos to spread terror. And they came into Syria with lots of cash. “In the next year  I saw the civilian structure that the free Syrian rebels had tried to create in the northwest transformed by ISIS,” Day recalls. On the corners where rebels used to hold protests, people were being crucified and beheaded. The refugee crisis exploded. Half the country was emptying out. The horrifying sideshow was the internal displacement of refugees, millions living in squalor on the border. From high ground, where their children were sickened or starving, parents could see a modern hospital functioning a mile away inside Turkey. The border was closed. An Iraqi woman walks in a field beside a temporary displacement camp for Iraqis caught-up in the fighting in and around the city of Mosul on June 24, 2014 in Kalak, Iraq. Photo via Getty. It was only when ISIS captured Iraq’s second city, Mosul, in June 2014, that the West took notice of the disappearance of the border between Syria and Iraq. It was now a huge swath of real estate that ISIS claimed as its Caliphate. Mohammed heard that Day was back on the border. He got in touch with her. “He was on a different planet,” she recalls. “His fantasy had come true.” She challenged him on the kidnappings of American journalists and crucifixions of civilians. “You’re insulting me!” he snapped. He insisted the end justified the means. Taken aback, Day asked, ‘When was the last time you talked to your sister?” Mohammed went mute. She realized he was isolated from anyone who might have kept him sane. ISIS was enjoying success beyond anyone’s imagining. They had earned the bragging rights of being America’s number one enemy. They dominated the U.S. news cycle. It fulfilled their prophecy. They could now claim that the U.S. was coming to them to try to steal their land and their oil wealth. They quickly mastered the propaganda machine of social media. She was asked to write a story about the atrocity for her former editor at The Daily Beast, now at Mashable. She couldn’t do it. In the early spring of 2015, Day made a harrowing trip into Syria to find the remnants of rebels in Aleppo. They were skin and bone. She had to bring them food. Although the anti-Assad rebels were reputed to have turned corrupt, Day saw no evidence they were profiting. Humbly apologetic, they said the only way they could keep her safe overnight in their small compound was to lock her in a closet, with her Arab cameraman. The next morning the rebels brought her strawberries. Now obsessed, Day spent the next few months calling her remaining contacts in Syria on satellite phones. She found a new camera crew and got a solid assignment from a major TV network to film a documentary on the refugee crisis. After doing daily security assessments, she finally flew to Turkey in March 2015. At the border she got word that the network was canceling her assignment. Too dangerous. By June, ISIS had advanced to Aleppo and Assad was bombing the highways clogged with fleeing refugees. The U.S.-trained rebels were pleading for air support, of the kind they had seen the U.S. giving to the Kurds. Who came to the rescue? Al Qaeda affiliates roared across Aleppo in jeeps to save the rebels from ISIS. Day was frustrated. From her perspective, major American news networks had refused for the last year to give assignments to journalists who wanted to go into Syria because of the expense and risks. Only a handful of American freelancers, including Day, had dared to go into the war-ravaged country on their own since 2012—despite having signed contracts with major news outlets on global safety principles and working conditions. But the pay offered is not at professional rates, she believes, which forces freelancers to cut corners on paying for their own protection. By the end of 2015, five years had passed since her early, giddy days covering the revolution in Tahrir Square. Horrifying memories interrupted her sleep. As an underpaid freelancer, she also had no health care benefits. She felt exhausted by what she saw as a lack of professional support from the industry. Last winter, Day pulled together a team of three top-notch American camera and sound men to make a documentary about the Syrian war. In the meantime, Day would retrace her travels to the original sites of Arab Spring revolutions and film their five-year anniversary protests, from Libya to Egypt to the Palestinian territories. “I recovered my joy in telling stories,” she told me this week. She even learned to shoot 360-degree video to offer viewers the on-the-ground feel of being in conflict zones. And in the new year, she prepared to go to Bahrain. Anna Therese Day at work in Bahrain. Photo courtesy Anna Therese Day. Bahraini security forces have a long history of torturing detainees during interrogation, and have continued even after their fierce repression of pro-democracy demonstrators in 2011 was documented by Human Rights Watch in their World Report 2016. 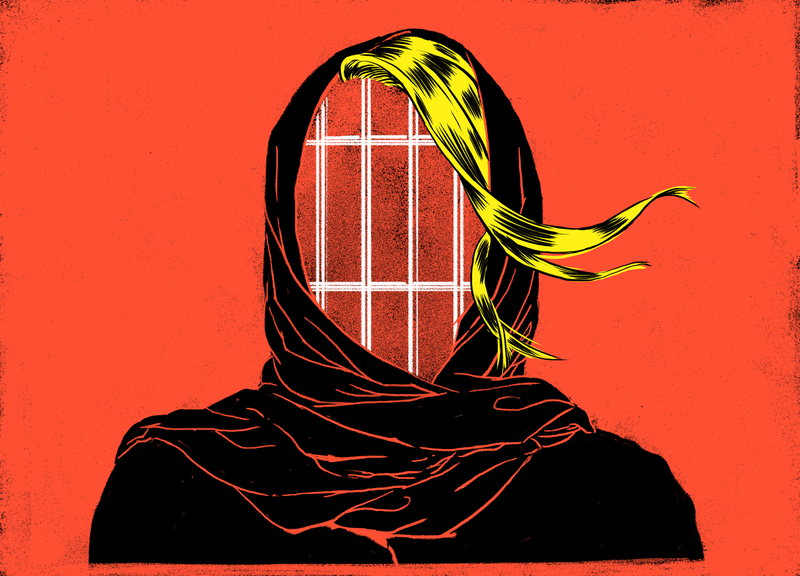 Mothers, fathers, and especially young teenagers are routinely “disappeared” in the middle of the night, blindfolded, kept in solitary confinement, and tortured until they confess—usually on camera. American journalist Anna Therese Day, and colleagues, detained in Bahrain on 14 February 2016. She is a 2016 Truman National Security project fellow, a 2016 adjunct professor at CUNY Graduate School of Journalism, a 2013 Fulbright Fellow, and was named one of Google Zeitgeist’s top 30 Great Young Minds of Our Time in 2011. I found Day back in New York last Sunday, when she came to my apartment to update me on her story. I opened the door to a pale, rail-thin young woman, clasping a borrowed cellphone to her ear. “I’ve just reached my family in Boise,” she whispered, and finished her call. All of her electronics and camera gear had been confiscated by Bahraini authorities. While poking at a plate of Chinese food, Day told me how the protests she had seen in Bahrain were among the most powerful she had ever witnessed. The little island was a Potemkin village. From the main highway, she saw glistening skyscrapers reminiscent of Singapore, but glimpses of the neighborhoods beyond revealed clouds of smoke from tear gas and Molotov cocktails. Local activists guided her and the crew to the protests. “Little wars had been going on, virtually on a daily basis, between police and protesters, for five years,” she told me. Mothers, fathers, and many children continually disappeared into jail. The government released tortured bodies as a warning. No help appeared while Day and her team were separately interrogated by Bahraini security forces. She cooperated, apologizing for not having registered as journalists. “Could we register now, and move on?” she asked. Instead, Day and her crew were charged in court, without attorneys or an embassy official present, with a sentence hanging over their hands of up to two years in prison. She admits she then felt terrified. To secure a single phone call, she staged a fit. “I had to act like a crazy person, crying and screaming, until our captors allowed me to call our embassy and beg for assistance.” Finally, American officials came through. “You’re on the CNN ticker right now,” her sister said. In no time, the story of the four American journalists held in detention in Bahrain blew up on social media. Day’s freelancers’ union pumped it out until it hit international news. Anna Therese Day felt grateful for an outpouring of support. Gail Sheehy is one of the founding writers of New York and has been a contributing editor to Vanity Fair since 1984. She has written about the character and psychology of presidential candidates from Robert Kennedy to Hillary Clinton and Barack Obama, and world leaders from Margaret Thatcher to Saddam Hussein. Sheehy is the author of 17 books. Passages (1976) was named by the Library of Congress one of the ten most influential books of our times. Her latest book is a memoir called DARING: My Passages.